GOOD WORK BY HALL OF FAMER Betsy King and Golf Fore Africa, the organization she founded in 2007. King explains her project to bring clean water to improve lives in rural areas. They are partnering with World Vision to raise money for wells. Betsy King won 34 times on the LPGA Tour, including six majors, and was inducted into the World Golf Hall of Fame in 1995. PHIL MICKELSON HAS COME TO HIS SENSES. I'm mostly a Mickelson fan, but his supreme confidence in himself and unapologetic takes cross the line at times. They strike me as arrogant. His behavior on the 13th green and explanation during the third round of the U.S. Open were Phil at his worst. He did something stupid in the heat of the moment. And then he dug in afterward, justifying his actions. It was a really bad look. Sure, the USGA got the setup wrong on Saturday, but it's cowardly to blame them. Golf is a humbling game. It certainly humbled the best golfers in the world at Shinnecock Hills. Judging from his apology, perhaps Phil is a bit more humble. I hope so. BROOKS KOEPKA LIKES HARD GOLF COURSES. They don't get much harder than Shinnecock Hills in the 118th U.S. Open. That suited Koepka but few others. Now he is one of only seven repeat champions in the long history of the national open. Koepka fired a closing 68 to finish at 1-over 281 and edge Englishman Tommy Fleetwood (2 over), who shot a record-tying 63 in the final round. The 28-year-old Florida native opened with a 75, followed with a 66 and carded a 72 on Saturday when historic Shinnecock Hills turned into a beast and produced average scores above 75. Bring it on, said Koepka. "I enjoy being pushed to the limit. Sometimes you feel like you are about to break mentally, but that's what I enjoy. I enjoy hard courses. I enjoy playing about the toughest in golf you are ever going to play." Nothing bothers Koepka, his caddie said. That's the perfect attitude for the toughest test in golf. Curtis Strange, the last man to win back-to-back U.S. Opens, marvels at the new athletic breed of tour pro and Koepka in particular. "[Koepka] is a good striker of the ball and he’s strong and he has a good short game,” he said. "He'd beat me like a yard dog." Koepka joins Willie Anderson, Bobby Jones, Ralph Guldahl, Ben Hogan and Strange in the elite club of repeating champions. Only Anderson has won three in a row. Koepka will have a go at that mark next June at Pebble Beach. Dustin Johnson at work on Shinnecock's greens. WORLD NO. 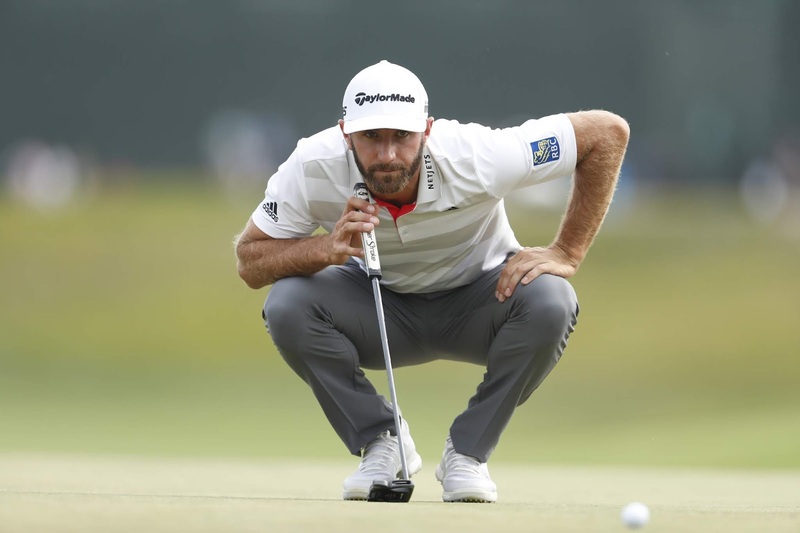 1 DUSTIN JOHNSON, Scott Piercy, Ian Poulter and Russell Henley shot 1-under 69 on a windswept Shinecock Hills Golf Club to take the lead in the opening round of the U.S. Open. Jason Dufner matched par with a 70. The rest of the 156-player field wandered through 18 holes making too many bogeys and others. The average first-round score was 76.4. Phil Mickelson had a 77. Tiger Woods and Jordan Spieth shot 78. Jason Day had a 79. And Rory McIlory carded an 80. This is already feeling like the olden days of the U.S. Open. FOLLOWING ARE USGA MEDIA NOTES on the 2018 U.S. Open field of 156 players, which includes 20 amateurs. OLDEST & YOUNGEST – Kenny Perry (pictured above), at age 57 (born Aug. 10, 1960), is the oldest player in this year’s U.S. Open field. Perry won the 2017 U.S. Senior Open and became the sixth player to win the championship twice. Steve Stricker (born Feb. 23, 1967) is age 51. Noah Goodwin, who won the 2017 U.S. Junior Amateur, is the youngest at age 17 (born June 20, 2000). FIELD FOR THE AGES – There are 10 players in the 2017 U.S. Open field who will be 20 years old or younger when the first round begins on Thursday, June 14. Philip Barbaree, the 2015 U.S. Junior Amateur champion, is one of five players under age 20. There are 17 players in the field who are 40 or older. Ernie Els, 48, won two U.S. Opens, in 1994 and 1997. Jim Furyk, 48, won the 2003 U.S. Open. The average age of the 156-player field is 30.13.
INTERNATIONAL GROUP – There are 27 countries represented in the 2018 U.S. Open. The United States has 83 players in the field, while England has 17 and Australia has 9. Countries with players in the field – United States (83), England (17), Australia (9), South Africa (6), Republic of Korea (4), Japan (4), Scotland (4), Canada (3), Spain (3), People’s Republic of China (2), France (2), New Zealand (2), Northern Ireland (2), Sweden (2), Argentina (1), Taipei (1), Colombia (1), Costa Rica (1), Denmark (1), Germany (1), Republic of Ireland (1), India (1), Italy (1), Mexico (1), Norway (1), Thailand (1) and Venezuela (1). FATHER AND SON – The U.S. Open's final round has been played on Father's Day since 1965. There are 10 father-son pairings who have played in the U.S. Open that include a champion. The father and son did not necessarily play in the same Open. In seven of the 10 pairings, the father is the champion. U.S. OPEN CHAMPIONS – A group of U.S. Open champions will play together at Shinnecock Hills Golf Club. Lucas Glover (2009), Graeme McDowell (2010) and Webb Simpson (2012) will start on the 10th hole on Thursday at 1:25 p.m. Glover won by two strokes in a Monday finish due to weather at Bethpage State Park (Black Course), in Farmingdale, N.Y. McDowell became the first European since Tony Jacklin in 1970 to win the U.S. Open, prevailing at Pebble Beach (Calif.) Golf Links. Simpson edged McDowell and Michael Thompson by one stroke at The Olympic Club, in San Francisco, Calif. THE 118TH U.S. OPEN BEGINS ON THURSDAY at Shinnecock Hills Golf Club in Southamption, New York. This is the fifth time Shinnecock Hills has hosted the national championship. Brooks Koepka is the defending champion. Willie Davis completed the first 12 holes in 1891 and head professional Willie Dunn contributed six holes by 1894. The path of the railroad line forced the club to acquire land north of the clubhouse, where, from 1916-17, Charles Blair Macdonald fashioned six new holes for play. William Flynn then constructed 12 new holes and largely altered Macdonald's layout from 1929 to 1931. The clubhouse, built in 1892, underwent a major restoration in 2016 but remains substantially the same as a century ago. Eighteen holes of stroke play are scheduled each day from Thursday to Sunday. In the event of a tie after 72 holes, a two-hole aggregate playoff will take place following the completion of Sunday's final round. TV coverage on FS1 and Fox. All times ET. The U.S. Open will have more than 115 hours of live streaming coverage at usopen.com and on U.S. Open app channels. RORY MCILROY DOESN'T SHY AWAY from sharing his opinion on many topics. As GolfChannel.com reported, McIlroy was asked after the third round of last week's Memorial Tourmanent if organizations such as the USGA truly understood the abilities of tour professionals. After all, they only host the best players in the world once a year. McIlroy said: "See, I think the USGA thinks that we're better than we actually are, if that makes sense. I think they overthink it. I don't want to single out Mike Davis here; I think it's a collective thought process....I don't think it should be as much of an exact science to set up a golf course as it is. I mean, get the fairways sort of firm, grow the rough, put the pins in some tough locations but fair, and go let us play." The U.S. Open tees off next week (June 14-17) at Shinnecock Hills in Southhampton, New York. U.S. Open tickets are still available. Take a look at TicketCity. I'VE HAD THIS IN MY EMAIL INBOX for nearly two weeks and am sorry I didn't share it earlier. LPGA star Carol Mann died recently and veteran golf journalist Jeff Babineau wrote a terrific article about her in MORNING READ. Babineau got to know Mann through the years and captures her well in his first-person piece, including her love and stewardship of the game. The year was 2006, and I had what was scheduled to be an easy assignment: A two-hour ride from Orlando, Fla., up I-95 to the World Golf Hall of Fame in St. Augustine, a short tour, and then a few quick words with Hall of Fame member Carol Mann, the 38-time LPGA champion and 1977 inductee who had taken a role as liaison between the hall and its members. I'd be home early. ARIYA JUTANUGARN DEFEATED HYO JOO KIM on the fourth playoff hole in the first year of the USGA's new two-hole aggregate playoff format. Jutanugarn became the sixth player to win both the U.S. Women's Open and the U.S. Girls' Junior Championship. This is the second time in Jutanugarn's prior five U.S. Open appearances that she made the cut. Her highest prior finish is T17 (2016). Jutanugarn is the first U.S. Women's Open champion from Thailand, and the 12th international champion since 2000. After the ninth hole in Round 4, Jutanugarn’s 16-under-par tied Juli Inkster's (1999) record for most strokes under par at any point in a U.S. Women's Open. Kim was the only player in the field without a bogey in the final round of the championship, and her 67 was the lowest final round in the field. Amid FOX Sports' ongoing U.S. Women's Open Championship coverage, FOX Sports Films debuts the second film in its EPICS series, TIGER AND ROCCO. The hour-long film documents Tiger Woods' historic win over Rocco Mediate at the 2008 U.S. Open Championship at Torrey Pines – Woods' final major championship win to-date. Featuring interviews with Mediate, Steve Williams, Hank Haney and USGA Executive Director Mike Davis, plus never-before-seen highlights and first-hand accounts of the championship, TIGER AND ROCCO offers viewers an unprecedented look at golf's ultimate test. TIGER AND ROCCO premieres Sunday, June 3 at 1:00 PM ET on the FOX broadcast network, preceding FOX Sports' final round coverage of the 73rd U.S. Women's Open Championship at Shoal Creek from 2:00 to 7:00 PM ET on FOX.